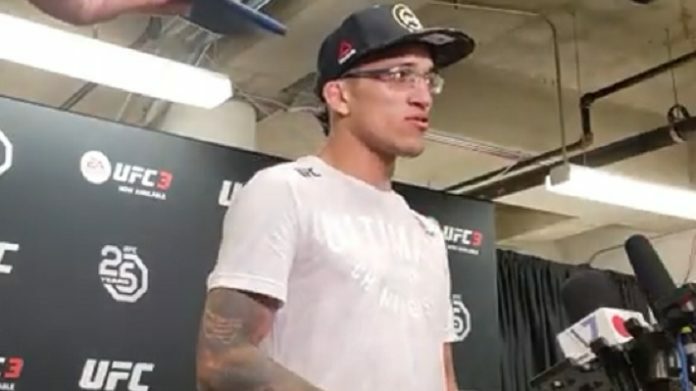 Charles Oliveira will return to the Octagon at UFC on FOX 31. UFC.com has announced that Oliveira will make his return against Jim Miller on the December 15th card. The show goes down from the Fiserv Forum in Milwaukee, Wisconsin. Oliveira comes off a submission victory over Christos Grigos at UFC Sao Paulo in September. That marked Oliveira’s second-straight victory, and the submission also put him past Royce Gracie for most submission victories in UFC history. As for Miller, he comes off a first-round victory over Alex White at UFC 228. It was a big win for Miller, who ended a four-fight losing streak. Miller was dealing with Lyme disease during his losing spell, however, he picked up his a victory nonetheless in his 30th ever Octagon appearance. Oliveira vs. Miller is actually a rematch from the pair’s initial clash at UFC 124 back in 2010. In that bout, Miller won a Submission Of The Night bonus for submitting Oliveira with a kneebar in the first round. They will run it back again on the UFC’s final card for FOX before the ESPN broadcast deal kicks in. The show will be headlined by Kevin Lee vs. Al Iaquinta. What do you think about Oliveira vs. Miller at UFC on FOX 31?